Saṃskṛtam (Sanskrit) known as “Divine Speech” and “Language of the Gods” in Indian tradition is the source of later languages of India. Precision is its beauty. “Philately” (Fr: Philatélie) is the study of postage stamps. The legacy that Sanskrit has left to us is India's legacy. 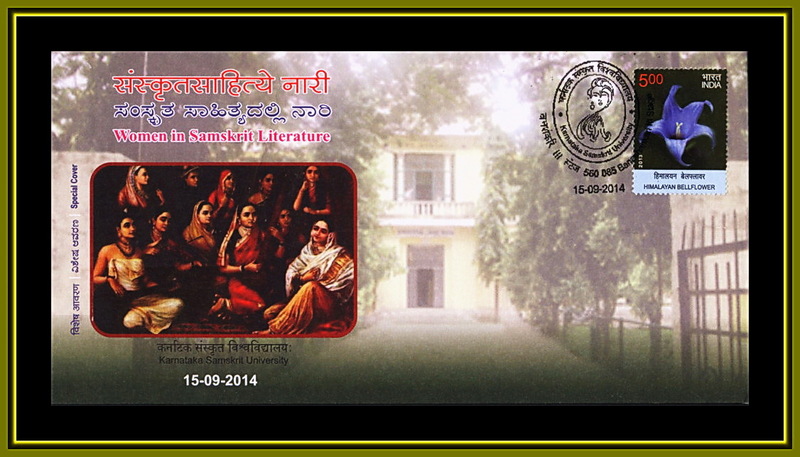 Displayed here are Stamps, Covers, Post Cards & Postmarks which have a bearing on Sanskrit. Translators and Promoters of Institutions are included. However, holders of a degree in Skt and quoters are excluded. Saṃskṛtam (spoken as "Sanskrit" in English) is an ancient and classical language of India. The Indian tradition calls it “daivī vāk” (Divine Speech) and “deva-vāṇī” (Language of the Gods). The divinely revealed Vedas are composed in ancient Sanskrit. Later languages and literature of India find a source in Sanskrit. The beauty of this exquisite language is in its precision. The word “Saṃskŗtam” means "refined or well done." The alphabet in Sanskrit is written in a script called Nāgarī or Deva-nāgarī. It is perfectly designed and suited for phonetics. Sanskrit shares its script with Hindi, India's national language. Pāṇini’s Vyākaraṇa (Grammar) is described as one of the greatest productions of the human mind. The flavor and fragrance of this rich language is reflected in the major epics, the Rāmāyaṇa (Vālmīkī), the Mahābhārata (Vyāsa), the Purāṇas and the Upapurāṇas. The great poets of classical age immortalized this language through their Kāvyas (Prose and Poetry), Nāṭakas (Drama) and Campus (Mixture of Prose and Poetry). The treatises on all branches of learning were written in Sanskrit -- Vedāṅgas (Auxiliaries to the Vedas), Darśana (Philosophy), Āyurveda (Medicine), Gaṇita (Mathematics), Vāstuśāstra (Architecture), Saṅgīta (Music) and Nātya (Dance), to name a few. The word "philately" is the English version of the French word "philatélie", coined by Georges Herpin in 1864. It is the study of postage stamps and postal history and other related items. A wide range of popular subjects are depicted on postage stamps which have contributed to the origin of collecting of stamps by the theme. It can be a great joy especially for those who have a real interest in the theme that they are collecting. It enhances one’s knowledge about the subject too. Generally, thematic collection is not bound by any rules. The choice is with the collector. 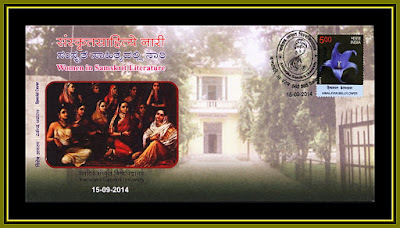 The theme I have selected for this Blog is – Sanskrit and Philately – on which topic I wish to focus my attention, the reason being its link with my learning and active interest in that marvellous language -- Sanskrit plus Philately. Here, nothing is MINE. All the information is gathered around from brochures, books and the Internet. My sincere thanks are due to everyone for their contribution. I have 99% of the materials exhibited here. Might have a few extras which I wish to dispose of and utilize the funds to propagate Sanskrit. Seriously interested philatelic friends can contact me by sending a mail.